The HSMC CoaXPress is the industry’s first High Speed Mezzanine Card defined by Altera providing a high performance CoaXPress compliant connection. It is capable of capturing video from up to 4 CoaXPress mode cameras and is ideally suited to industrial, defense and aerospace applications. This mezzanine card can be also used as camera simulator, emulating up to 4 transmitting channels. 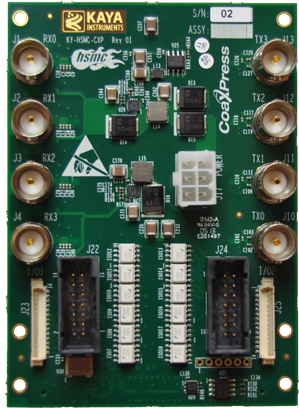 The HSMC CoaXPress offers customer specific data pre-processing or custom protocols are easily accommodated via FPGA carrier card. The HSMC CoaXPress also provides isolated GPIO for input/output signals, such as triggers, shaft encoders, exposure control and general I/O. 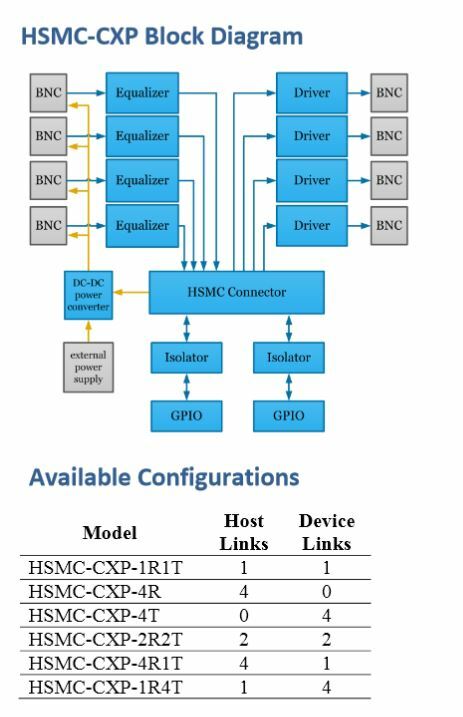 The HSMC CoaXPress uses a standard HSMC connector as an interface to the host board, general purpose I/O and external power supply connector. Up to 4 host and 4 device links can be provided using vertical BNC connectors. Each link supports standard CoaXPress bitrates up to 6.25 Gbps. Each host link is capable of providing up to 13W of power to compatible devices via Power over CoaXPress (PoCXP). The HSMC CoaXPress can support up to 4 individual host links, or combinations of aggregated CoaXPress links (e.g. two cameras requiring two links, and two additional cameras each using one link). Additionally, up to 4 individual or aggregated device links are supported.